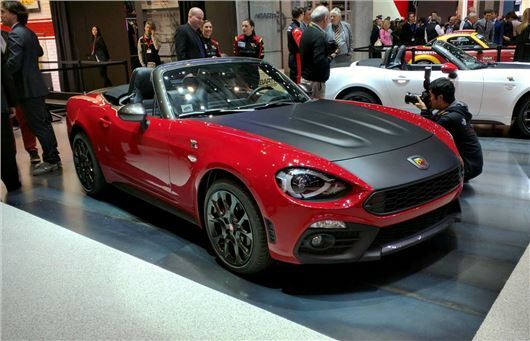 It was only a matter of time before Fiat tuning house Abarth turned its attention to the Mazda MX-5-based Fiat 124 Spider, so here it is. It’s on sale imminently priced at a shade under £30,000. Rather than a massive power hike, the Abarth 124 gets just 40PS more, taking power to 180PS but still good for a 6.8-second sprint to 62mph. It’s that quick because the 124 is so light, weighing just over a metric tonne, so the standard 1.4-litre turbo engine will suffice. Most of the work has gone into making this the sort of roadster that can genuinely outsteer the class-leading Mazda MX-5 donor car, albeit these things are subjective. A manual transmission is standard but there’s a six-speed auto if you like, while the brakes and suspension are both upgraded. A Brembo setup takes care of stopping, the dampers are stiffened for better road feel, and a mechanical limited slip differential is standard. The exhaust is replaced too, with a setup called the Record Monza system that's notably louder than the standard thing. Inside, Alcantara abounds, and despite the sporty remit the equipment level is high, including climate control and Bluetooth.